Turning 12 was a big year for Silvia Leppälä. She started seventh grade at a Seventh-day Adventist school in Finland. She stopped attending church every Sunday with her parents. She smoked her first cigarette and drank alcohol for the first time. 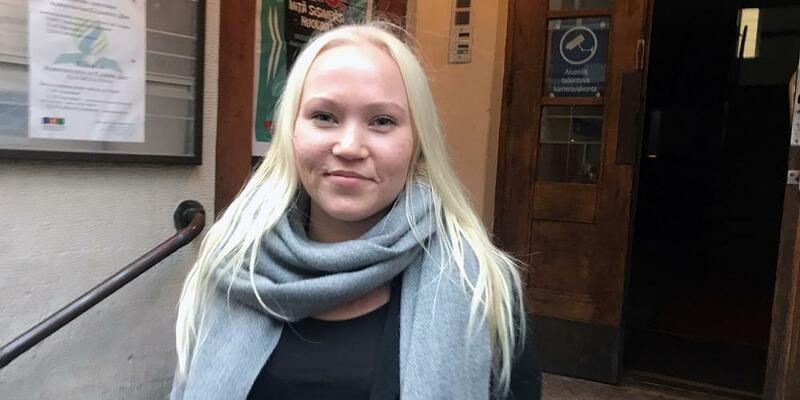 Silvia, who studied at a public school until the seventh grade, liked her new school, Finland Junior College, in the small town of Piikkiö in western Finland. But she had friends from the public school, and she hung out with them after classes. One day, Silvia was walking along a street in Piikkiö with a group of about 10 friends from the public school. As they talked and laughed, another 12-year-old girl pulled out a packet of cigarettes and held it out to Silvia. Silvia had never smoked, and she didn’t know what to say. She looked at the girl. She glanced over to her other friends, who were also her age. Some of them were smoking. They all stared at her and waited to hear her reply. Silvia was afraid that they would make fun of her if she refused to smoke with them. She worried that they might stop being her friends. “Sure, I’ll smoke one,” she said, trying to sound confident. The smoke from the cigarette didn’t taste good at all, and Silvia coughed. But she tried to hide the cough, and she stood up tall. She liked holding the cigarette between her fingers. She felt she was cool. Several weeks later, one of Silvia’s friends came over to her house to spend the night. The two girls were alone in the bedroom after Father and Mother had gone to sleep. The friend opened her purse and pulled out a bottle of vodka. “Let’s try this!” she exclaimed. “Where did you get that from?” Silvia asked, surprised at the thought that another 12-year-old girl could buy a bottle of alcohol at the store. The friend whispered that she had stolen the bottle from her parents’ cupboard. “Do you want to try?” she persisted. Silvia didn’t really know what vodka was and what affect it would have on her. The friend mixed the vodka with some sweet soda, and the girls drank from two glasses. Silvia felt the same as when she had smoked the cigarette. She felt she was cool. Friends offered Silvia cigarettes and alcohol many more times that school year. Every time she was offered, she found it easier to say yes. Sometimes she asked for cigarettes or alcohol. She wanted to feel cool. But her love for smoking and especially drinking grew year after year. When she finished ninth grade, she left the Adventist school to enroll in a special school to study how to be an accountant. But she couldn’t stop drinking. When she was in school, she had drunk about once a month. Now she was drinking every weekend. She found it hard to study. She felt sad all the time. She cried every night and often during the day. Silvia hadn’t gone to church for quite some time. She had stopped going because she didn’t care and thought it wasn’t interesting. But now she wondered whether God could help her. She remembered the Lord’s Prayer, which she had memorized when she was little. She closed her eyes and prayed, “Our Father in heaven, Hallowed be Your name. Your kingdom come.Your will be done on earth as it is in heaven. Give us this day our daily bread.And forgive us our debts, as we forgive our debtors. And do not lead us into temptation, but deliver us from the evil one. For Yours is the kingdom and the power and the glory forever. Amen” (Matt. 6:9-13). She opened her eyes. She felt the same as before. One day, her parents invited her to go to a prayer meeting at her old Adventist school. Her parents weren’t Adventist, but they liked to go to Christian programs. They wanted Silvia to go with them because they were worried about her. Silvia listened to people sing about Jesus. She prayed. When she left the prayer meeting, she was crying. She wanted to know more about God. The next morning, she found a Bible at home and read a chapter. She read another chapter the next morning, and the next. When friends called her to go drinking, she refused. She knew that they were a bad influence on her and she would be tempted to drink and smoke if she joined them. She didn’t want to drink and smoke anymore. It didn’t feel cool. After a while, friends stopped calling. But Silvia wasn’t sad or lonely. She had found something better. She was spending time with Jesus, and He was becoming her best friend. After a while, Silvia decided that she want to help people by becoming a physical therapist. She started classes in Finland’s capital, Helsinki, and began to make friends with people her age at the Adventist church. She studied the Bible with them every Friday evening and attended church every Sabbath. She volunteered to help cook and feed the needy at an ADRA soup kitchen. To her parents’ delight, she gave her heart to Jesus and was baptized a few weeks ago. Silvia, who is now 23, would like to warn other girls and boys to stay away from alcohol and cigarettes. Planting a Church in the City From the heart of the city of Melbourne, Australia. Pastor Roy and his family encounter a new and diverse group while they venture into church planting.